Want to get the media’s attention? Want them to tweet just how curious they are about your company (to the thousands that follow them)? Fabrisonic LLC, a client of Felber PR & Marketing since 2014, produces metal parts via additive manufacturing. Read on to see this out of the world story of how a pre-show media promotion got Fabrisonic social media recognition and press to follow. Journalists and the stories they write in trade publications can often be a great source of lead generation for manufacturers. The two-part series we previously published How to Attain Media Interviews at Industrial Trade Show explains the importance of media engagement and also, provides a step-by-step guide to create strong media relationships that lead to press. Additive manufacturing is a competitive industry and new companies are popping up left and right. Fabrisonic recently attended and exhibited RAPID 2018, a 3D manufacturing trade show which attracts thousands of attendees every year. Fabrisonic’s 10’ x 10’ booth may have appeared small in comparison to its mega-million-dollar competitors but they made a mighty impression on industry media prior to the show that generated significant traffic to their booth. Fabrisonic’s CEO and President, Mark Norfolk, had 13 media interviews throughout RAPID 2018 that lead to stories, and credible, published stories lead to qualified inquiries. Oh, and Fabrisonic’s booth neighbors complained all the media and other attendee traffic they were receiving. We’re SO sorry about that, not! Now you may be asking yourself, “This sounds great but doesn’t it take work?” The answer is absolutely, but the exposure and recognition that comes with press is a worthy investment. Editors and writers are busy, just like all of us. You need to quickly and succinctly get their attention. They need to see value in reporting on your company and MUST see the connection to their reader. They get tons of email and phone pitches. How can you possibly get confirmed on their calendar during a jam-packed three-day tradeshow? 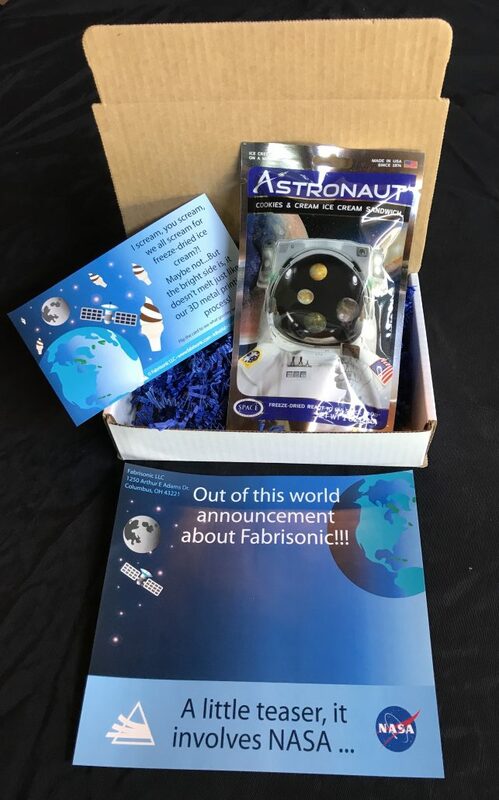 Focusing on Fabrisonic’s Out of this World news about their NASA achievement, we designed a package and sent each journalist their very own treat of astronaut ice cream. Yes, you still need to reach out via phone and follow-up emails, but now you have their attention. Did it work? Check out these posts from journalists in US and England (complete with photos of the package sent!). In addition to the story-yielding interviews, social media before and during the show drove heavy booth traffic starting on day one of the three-day show. Journalists not only reposted our social media to their audiences, they also responded to outreach via this channel. The team at Felber PR also monitors all the social streaming from our client’s tradeshow. Recently, two journalists posted to the twitter-verse that they were at the show and “let’s meet up.” We emailed the journalist the CEO’s mobile number and a text message resulted in another interview meeting. All this by simply paying attention to the feed. Working with reporters and editors is the same as sales. It all starts with the relationship. 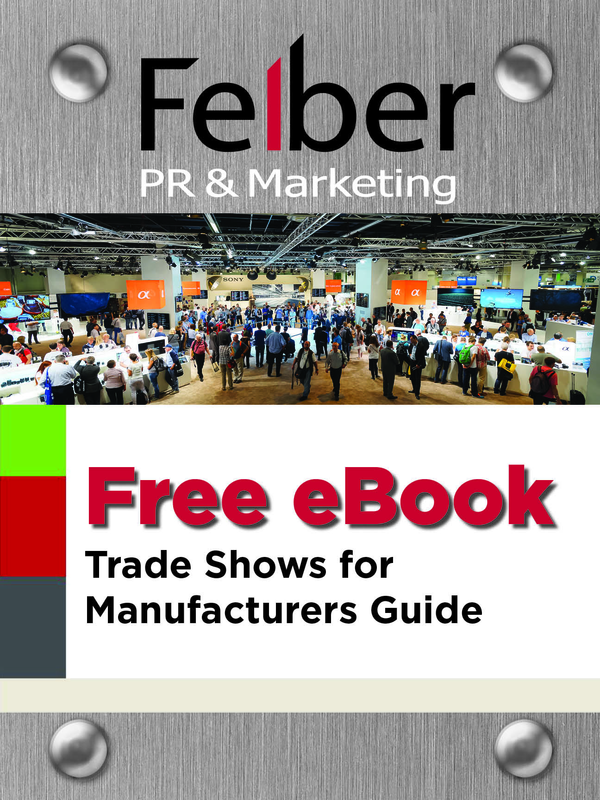 Click to download our Trade Shows for Manufactures eBook below to discover how you can engage media at your next trade show. To Download our Trade Shows for Manufacturers Guide, click the photo below. https://www.felberpr.com/wp-content/uploads/FelberPR-logo.gif 0 0 Rob Felber https://www.felberpr.com/wp-content/uploads/FelberPR-logo.gif Rob Felber2018-05-07 11:34:052018-05-09 12:49:50Media Appointments That Are Out of This World – Case Study, Fabrisonic LLC.